Bridget Note: A second grade class across the country from me asked if they could do reviews on my blog too. I loved the idea so for the next few Mondays, they will be the guest reviewers. If you know a kid who wants to be a reviewer, let me know. 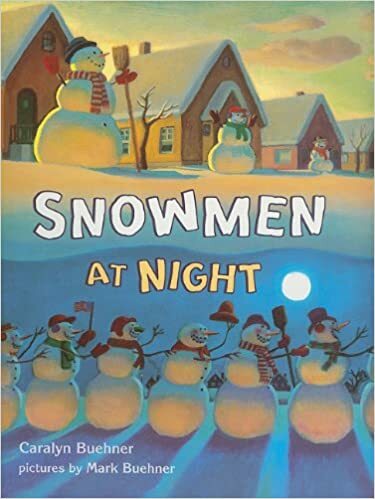 Summary of the story: This story is about what snowmen do when we are asleep. Some snowmen do some stuff like sledding and playing baseball with snowballs for balls and brooms for bats. That is why when we wake up our snowmen are so droopy! What did I like? I like when they played baseball. Overall review: I loved this book because I like funny stories. Who else might enjoy this story? I would recommend this book to teachers who like fantasy stories. Welcome as a guest reviewer. Snowmen are some of my favorite people. I always hated it when they melted. They are a lot of fun to build. I never thought of them actually doing things like playing baseball. Frosty skated and rode a sled. I’ll have to read this book to see what I missed my snowmen doing.